As you know I stay fairly focused on municipal issues, especially as they relate to Edmonton. But with the provincial budget set to be released on Thursday, a televised address from the Premier tonight, the review of the Municipal Government Act, and expectations of an imminent election, I’ve been thinking more about provincial politics lately. Here’s a brief summary and some thoughts on what I’ve been paying attention to. Tonight, Premier Jim Prentice delivered a 16 minute address called Alberta Looks Ahead on CTV (which apparently cost between $80K and $100K). “We are a turning point in our province,” he said at the beginning. He described the need for “thoughtful decisions for the future” and said Albertans have told him they want balance. The Premier talked a lot about how he is determined to restore our commitment to the Heritage Fund, and said “paying off our debts is something we simply must do.” If I remember correctly, he mentioned only two former Premiers by name: Peter Lougheed and Ralph Klein. Dave is probably the most well-known political blogger in the province. You can see his latest nomination update post here. The Premier is also planning to host a series of Telephone Town Halls along with various Ministers, on March 25 and March 30. You can dial in toll-free at 1-855-269-4484. Tonight I saw many complaints about robocalls, so it’ll be interesting to see how those town halls are received. I’m not sure how representative the results are, but it’s useful data to consider nonetheless. Budget 2015 will be released on Thursday, March 26. You can download all the data as a 13 MB Excel file. Give it a go and have some fun! I hope this is a sign of things to come in terms of making information available through the open data catalogue in a timely fashion. Municipalities would be required to adopt public participation policies that outline their approaches for engaging with stakeholders. Edmonton already has a policy for this and is actively review and improving its approach to public engagement. Existing petition requirements make it difficult to successfully petition a municipality, so one proposed changed would allow municipalities to change the rules for petitions. Currently municipalities need to use snail mail or newspapers to notify the public about things like bylaws and public hearings, but this is 2015! The proposed change would make it possible for municipalities to announce notifications online or using other methods as they see fit. Another change would require municipalities to adopt three-year operating plans and five-year capital plans. Edmonton is already moving in this direction. Municipalities are currently required to have statutory plans, but there is no explicit hierarchy specified, they simply need to be consistent with one another. The proposed change is to identify the hierarchy and relationship of those plans. In Edmonton, this could impact The Way Ahead. Another change would allow for the creation of civic charters, which the Province, Edmonton, and Calgary have already been pursuing. There are more amendments still to come. Additional review and consultation will take place this spring with the goal of proclaiming the fully revised MGA and regulatory updates by the end of 2016. Another pre-election, pre-budget announcement was about the allocation of $400 million in MSI funding. Edmonton is slated to receive just over $80 million out of that, which is less than half of what the City was expecting for 2015. “Until we get the provincial budget, I won’t know how much additional dollars are available and we won’t be able to make any decisions about which projects go ahead until we see the provincial budget,” said Mayor Don Iveson. For its part, the Liberals have called the MSI announcement “an elaborate ruse” due to some creative accounting with the Basic Municipal Transportation Grant. Also tonight, we held our third #abvote Hangout at http://abvote.ca. In addition to Dave, Ryan, and myself, we had the three Wildrose leadership candidates join us: Drew Barnes (MLA for Cypress-Medicine Hat), Derek Fildebrandt sitting in for Brian Jean (Former MP for Fort McMurray - Athabasca) and Linda Osinchuk (Former Mayor for Strathcona County). We started with a discussion about the Premier’s address, and then moved on to some other questions for the candidates. I asked a question about how they’d support municipalities, and of course the Wildrose 10/10 plan came up, which would allocate 10% of tax revenues and 10% of surpluses to municipalities. They’re rushing this race, but with speculation the writ will drop on March 30, they don’t have much of a choice. You can learn more about how voting works for the leadership race here. The Wildrose party will announce its next leader on March 28 in Calgary. A couple of weeks ago Edmonton-Centre MLA Laurie Blakeman announced she has accepted the nominations to be a candidate for the Liberal Party, Alberta Party, and Green Party. We talked to her about this in a recent #abvote Hangout. Of course that followed the other big Laurie Blakeman-related news: Bill 10 was amended and passed. 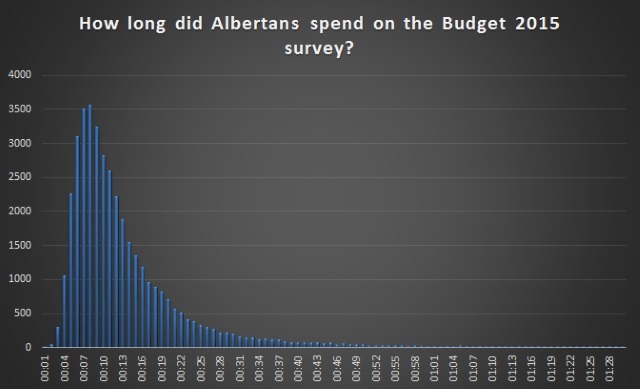 #PrenticeBlamesAlbertans became a huge thing on Twitter early this month. Dave has the story. I also talked about this with Graham Hicks in a recent podcast episode.